Provide comfort for the family of MARY PARIS with a meaningful gesture of sympathy. 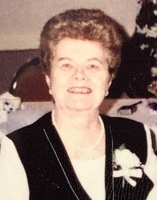 Mary (Dutmer) Paris, 89, of Oak St., Negaunee, passed away peacefully Wednesday afternoon, March 20, 2019 at the Eastwood Nursing Center with her loving family at her side. Mary was born June 14, 1929 in Battle Creek, MI to Mary E. Dutmer. Her mother tragically died during child birth, leaving Mary to be raised by her maternal grandparents, John and Rose Dutmer, and her Aunts, Carrie and Rose. She grew up in Marquette and graduated from Bishop Baraga High School, Class of 1947. Mary married Louis ‘Reno’ Paris on May 14, 1949 and together they made their home in Negaunee. Prior to marriage, she worked as a secretary at UP Office Supply in Marquette, and was then a loving and devoted homemaker to her family. Mrs. Paris was a devout member of St. Paul Catholic Church, Negaunee where she was a former president and secretary for the Altar Society and also volunteered at the homeroom mother in her daughter’s classes at St. Paul School. She was a woman of deep faith and raised her daughters the same way. She spent countless hours listening to Gospel Opportunities, which she did until the day she died. In her spare time, Mary enjoyed playing cards and games, working puzzles, reading, knitting and sewing, cooking and baking, watching movies, and loved walking and biking. She also loved chocolate and never passed up a good dessert. In their younger years, Mary and Reno enjoyed dancing and entertaining at their camp on Noreen Lake. Surviving are her 2 daughters, Connie (Jerry) Penney of Negaunee and Mary Lynn (Greg) Mantyla of Gwinn; 5 grandchildren: Stephanie (Chad) Hintsala, Pamela Thorne, Christopher (Megan) Penney, Jocelyn Atkinson and Zachary Mantyla; 8 great-grandchildren: Tyler, Megan and Autumn Hintsala, Zachary Thorne, Jameson Penney, Chloe and Blake Atkinson and Nigel Penney; a great-great grandson, Logan Minarik; sisters-in-law, Mary (Gerald) Paju and Audrey Paris; a special cousin, Bobby Dutmer; and many nieces and nephews. She was preceded in death by her mother and her loving family that helped to raise her; husband, Louis ‘Reno’ Paris in 2014; a nephew, Jeffrey Paju; and numerous aunts and uncles. A Mass of Christian Burial will be celebrated at 11:00 am on Monday, April 8th at St. Paul Catholic Church, Negaunee, with Rev. Larry Van Damme officiating. Interment will be in the Negaunee Cemetery. The family will greet relatives and friends for one hour prior to services at the church on Monday, and also at a luncheon immediately following services at the St. Paul School gymnasium. In lieu of flowers, memorial contributions may be directed in Mary’s memory to The Facial Pain Association, 22 SE 5th Ave., Ste. D, Gainesville, FL 32601, or Gospel Opportunities, WHWL/WEUL/WHWG, 130 Carmen Dr., Marquette, MI 49855. The family would like to extend a special thank you to the wonderful and caring staff at the Eastwood Nursing Center for the loving and compassionate care provided. Mary’s memorial page may be viewed at koskeyfuneralhome.com, where memories and condolences may be shared. To send flowers in memory of MARY L. PARIS, please visit our Heartfelt Sympathies Store. Provide comfort for the family of MARY L. PARIS by sending flowers. Our prayers and thoughts are with you Connie, Mary Lynn and family... May God hold you all in the palm of His hands throughout this journey..
May the family of Mary L. Paris please accept my sincere condolences hoping you find comfort in God's words at Acts 24:15 and Psalm 37:29.